On the latest episode of the iDisciple Podcast, iDisciple CEO David Henriksen is joined by Clay Scroggins, the lead pastor of one of the largest congregations in America, North Point Community Church. 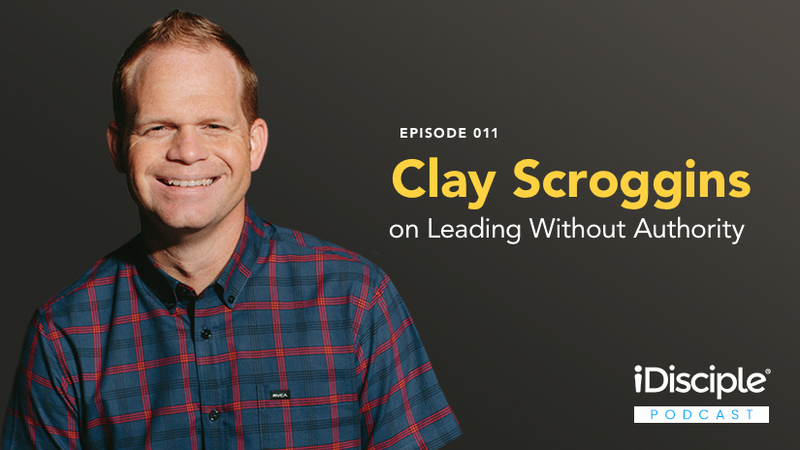 Clay will be sharing with us stories from his early days in ministry working under great leaders such as Andy Stanley and Louie Giglio, as well some of the leadership insight from his brand new book, How to Lead When You’re Not in Charge: Leveraging Influence When You Lack Authority. Over the years, Clay has worked his way through many organizational levels at North Point Ministries, from facilities manager to high school volunteer, and knows all too well the frustrations of authority deprivation. His new book takes a look at some of the challenges you might face when you want to lead but aren’t in charge, and offers wisdom and tips to improve your walk as a leader. We pray that David and Clay’s discussion will challenge you to lead well, no matter what position you find yourself in! Clay recalls a story from when he was asked to host one of the Passion Conference venues, and the great leadership advice that Louie Giglio gave him beforehand. Why finding your own identity as a leader is more crucial than mimicking another person’s leadership style. Clay breaks down two of the four behaviors that allow people to have influence: leading yourself and choosing positivity. What to do when you have a boss that actively hinders your ability to lead. The meaning behind the phrase “choose a closet to clean,” and why you should look for ways to serve without being asked to. If you would like even more life-changing content from authors and pastors like Clay Scroggins, download the iDisciple app for your preferred mobile device today! Since 2013, iDisciple has been leading people into a closer relationship with God through music, sermons, and devotionals, all in the palm of your hand! Check out iDisciple to learn more.